Explanation: What's that heading for the Pleiades star cluster? It appears to be Comet C/2016 R2 (PanSTARRS), but here, appearances are deceiving. On the right and far in the background, the famous Pleiades star cluster is dominated by blue light from massive young stars. On the left and visiting the inner Solar System is Comet PanSTARRS, a tumbling block of ice from the outer Solar System that currently sports a long ion tail dominated by blue light from an unusually high abundance of ionized carbon monoxide. Comet PanSTARRS is actually moving toward the top of the image, and its ion tail points away from the Sun but is affected by a complex solar wind of particles streaming out from the Sun. Visible through a small telescope, the comet is fading as it recedes from the Earth, even though it reaches its closest point to the Sun in early May. I'm very glad to see this APOD! Comet C/2016 R2 (PanSTARRS) meets the Pleiades. 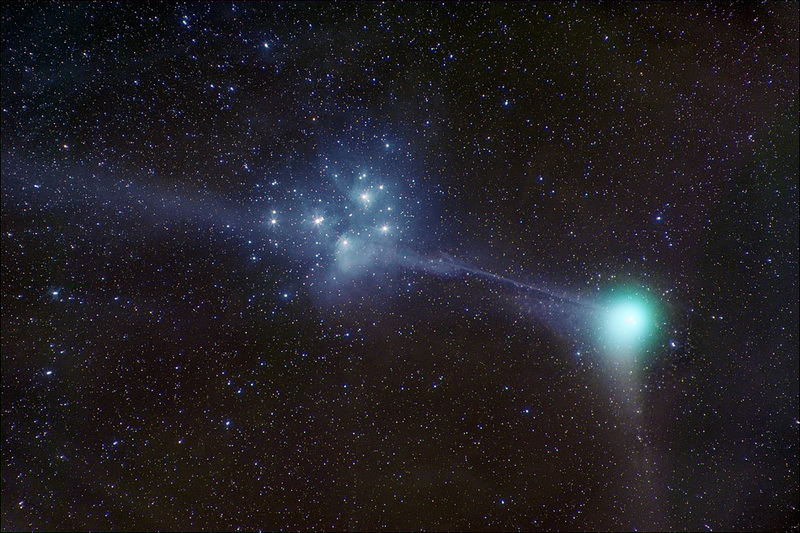 Comet Machholz meets the Pleiades. I don't know if Tom Masterson has imaged Comet C/2016 R2 and the Pleiades in the same way, but the delightful juxtaposition of these two objects gives me a great "feel" for the color of the comet! The blue color of this comet is fantastically unusual. Typically, of course, the coma of a comet is bright green. Stefan Seip's picture of the Pleiades and (bright) Comet Machholtz demonstrates the "normal" color contrast between the Pleiades and a comet. Hi! The text says that the comet is visible with a small telescope. The comet current magnitude is 11.5 (heavens.above.com) Please tell me . What kind of telescope do you need to see an 11.5 magnitude objet? I don't think it's so small. constantino wrote: Hi! The text says that the comet is visible with a small telescope. The comet current magnitude is 11.5 (heavens.above.com) Please tell me . What kind of telescope do you need to see an 11.5 magnitude objet? I don't think it's so small. You need a 32 inch telescope on top of a mountain. Love this image and always look out for the Pleiades whenever the sky is clear. Also I wonder what any Native Americans think of this image? 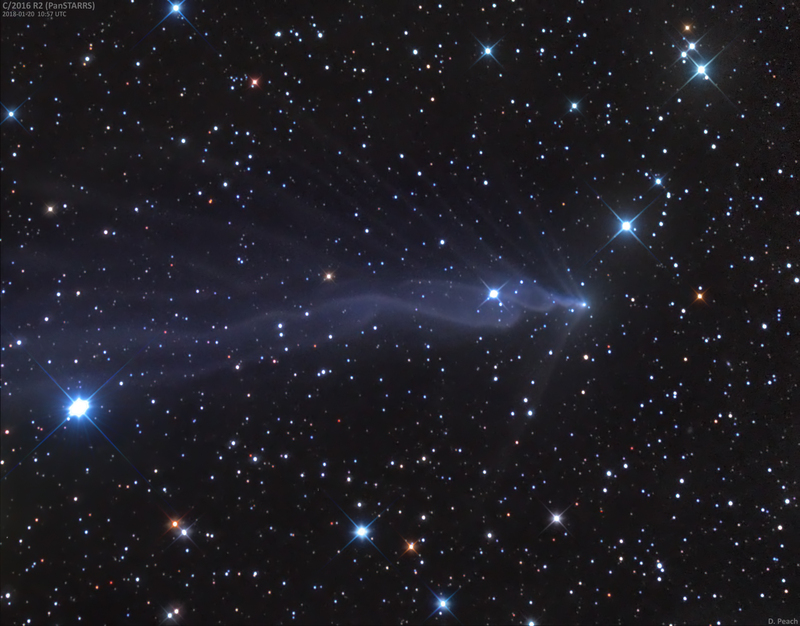 Documenting the corkscrew twists and turns of the tail of PanSTARRS (C/2016 R2) and the comet's unusual blue color has held the attention of astrophotographers in recent weeks. Sign up to the comet mailing list for more details and photos. Visually, the tail is barely detectable, but an 8-inch or larger telescope will show a nice 10.4-magnitude patch of haze about 4′ across with a DC = 3. The comet's quite easy to find with ample naked-eye stars nearby: it crossed the Hyades a week ago and will pass just 2° northwest of the Pleiades at the end of the month. It appears that C/2016 R2 is unusually rich in frozen carbon monoxide (CO), which when ionized by ultraviolet sunlight, fluoresces blue. constantino wrote: What kind of telescope do you need to see an 11.5 magnitude objet? FWIW, there is a Telescope Limiting Magnitude Calculator at Cruxis.com. It turns out that 11.5 doesn’t require extreme apertures, but the limiting magnitude depends on a lot more than just aperture, as the form shows. Thanks APOD for featuring my image!! Very humbled and honored! Glad so many like my image and great discussion as always! For a little background on my approach to taking this image which might explain how the comet appears as bright as it does I decided to shoot rather long sub exposures for a comet at 5 minutes and a high ISO 1600. I was watching a lot of images come in of C/2016 R2 and thought that with the large FOV that I have with my equipment it might be good to go for longer exposures as the movement of the comet would be pretty imperceptible when it came to stacking. Turns out I was right! If you look in planetarium apps or desktop software and you skip forward in time you'll notice that at this time from our vantage point it's not moving a whole lot in the sky each night. Most of the other comets I've imaged in the recent past shooting 5 minute subs would really smear them since they were all moving in the sky pretty quickly. The nucleus of the comet only moved very slightly in each frame so I wasn't even able to do a proper comet stack in Deep Sky Stacker. I was very surprised by the color I was able to pull out of the resulting stacked image! With some stretching I was shocked that it appeared even more vibrantly blue than M45! One thing I was thinking about after looking at this image for a bit I've noticed that the tail may even extend past the FOV to the left, it's quite faint but it seems like more may be visible in a different framed long exposure stacked image. I also see what appears to be a kind of spiraling in the tail that was present in some other images with a more detailed and closer FOV's. A lot went right when this image was shot, I had excellent seeing/transparency at the Bortle 2-3 site where I was, and I had a really good polar alignment and tracking was perfect. If I had time I may have shot it at 10 minute subs, and may still if I get a chance this month. As for the visibility through a small telescope I do agree with the editor's, especially if you have a fast scope like the one I shot this with that is at f4.9. I would imagine in a large FOV very fast Dobsonian this comet might be a lot of fun! At the time when this was shot the comet was really close to zenith so I had trouble seeing it in my 20x80 celestron binoculars but I think I saw it very faintly, it's hard to tell since it was hard to hold them steady when looking straight up (I need a bino mount for them . At the time when this was shot the comet was really close to zenith so I had trouble seeing it in my 20x80 celestron binoculars but I think I saw it very faintly, it's hard to tell since it was hard to hold them steady when looking straight up (I need a bino mount for them . A tarp or air mattress would probably suffice. You can see an 11.5 magnitude star in 60mm binoculars! I've seen the mag 15 central star of the Ring Nebula more than once in an 8 inch scope. As you've told us many times, Chris: extended objects just get bigger...only unresolved point objects get brighter. SpookyAstro wrote: For a little background on my approach . . . If anyone is interested here is the technical info for this image: . . . Thanks for the details, Tom. It really helped me understand more of what was involved to get the image ... which is a very cool and surprising scene! The blue of the CO tail is so deep. Is it known why this ion tail forms a shape that looks almost like a corkscrew? Just random fluctuations in the solar wind? I'm not sure if there is an exact determination as to why it appears this way, could be because the solar wind for sure. I was also thinking about how there could be possibly a couple jets are very active spaced far apart or pointed in close to opposite directions and the comet's rotation has something to do with it? Could be all of the above! Ann wrote: I'm very glad to see this APOD! Very interesting points, the color is crazy, I could hardly believe it while I was post processing the image! I don't know why but it might have something to do with it's particular surface brightness related to a larger field of view which makes it show up so vibrantly blue in my image. 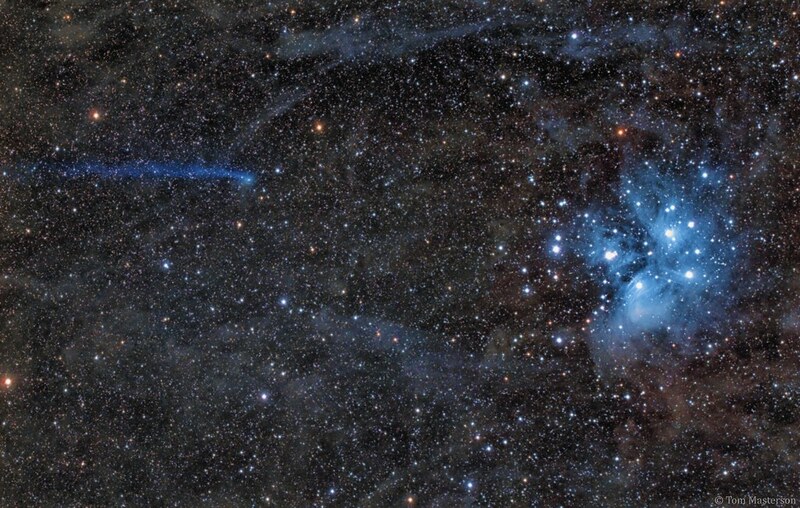 In Rogelio Bernal Andreo's recent APOD of C/2016 R2 and the Hyades (https://apod.nasa.gov/apod/ap180118.html) it shows up vibrantly blue as in my image. At longer focal lengths and perhaps shorter exposures there is less color but much more detail as seen in Damian Peach and Jose J. Chambo's APOD (https://apod.nasa.gov/apod/ap180112.html). When I was processing my image after stretching it a bit I normally do incremental adjustments to the vibrance and saturation to make it more colorful but with this image I held back and didn't use as much vibrance and saturation as I might normally because of how much blue there already was in there! It's a very interesting comet! I think it's some kind of instabilities, forget what they're called now. Wow. Thanks for posting that one. Damian's image really shows the spiral very clearly, as you said. I wonder if the comet is rotating, as one possible cause for this.